It's time to share the complete walkthrough for MechBox 2 with you guys, the seqeel of the already popular MechBox by OGUREC APPS. To solve the first level you must move those bars (green, yellow, orange, red) it the middle screen, then move them to the 3rd screen. You must place them in the same order as they were at the beginning off the level. The buttons have dots on then, so start by pressing them in ascended order: Moon - Square - Arrow - Circle. Now you get the code by counting the corners of each shape: Moon - 2, Square - 4, Arrow - 7, Circle - 0. So the password is 2470. Now use the screwdriver to unscrew the panel over the PLAY button. Now use the magnifier glass to look around for for some numbers that form the next code 1, 6, 8, 0. Now to find the right order take a look at the place where you found the screwdriver. There are 2 arrows pointing down, so the right order is from top to bottom, so the final code is 0891. The start is a bit trial and error to find the order in which you need to press the buttons. If you imagine them as a cellphone keyboard the order will be this: 836-512-479. Now take the middle-bottom button from the keypad and place it in the slot on the right. Press the button, take the chip and place it in the slot below the keypad. Now slide down the slot where the chip was to reveal the next clue. It looks like an equation but just look at it like roman numbers: I V II IV in other words: 1524. Now you have to figure out the code in that image, to do this you need to tilt the phone and look at the image from the bottom side. If done right you will be able to read this words: ENTER 3695 ENTER. There's an hidden slot on the left side of the keypad, drag it left and then up, now use the screwdriver to unscrew the panel on the right. Now place the battery on the keypad slot to activate it. Now you have to find the numbers that correspond to the word "IDEA", and is just the number of each letter in the alphabet, so the code is 9451. You will notice that the small button in the middle of the screen moved to the right. So take out the battery and place it in it's original slot. To figure out the next code you have to count, and add up, the number of holes in each number. So the final code for level 4 is 6128. Start by making all the "clocks" point up. You should be able to do this by yourself. Enter BIOS password, you can spell BIOS using numbers: 8105. Now press "1" to take the floppy disk, than enter "2" until you break the "clocks". Tap on the right clock several times to get a floppy disk. Take it an enter it in the computer. The clue to solve it is CAESAR-1, which means Caesar cipher. To sole it you have to move one letter back in the alphabet. You can use this pace to decipher it yourself, if you want. After you decode it you get this: NINE – ZERO – FIVE – TWO – NINE – ZERO – FIVE – TWO – NINE – ZERO – FIVE – TWO, so the code is 9052.
nC - number of Cows, which is the number of incorrect colors you selected. .N - attempts left until the level resets. So in other words you have 9 attempts to find the correct colors on each buttons. If you understand the rules it should be easy to solve the puzzle. Now you have to match the colors with the wires on the right. The order is from top/above to the bottom, so it goes like this: yellow - red - blue -green. Now slide the keyhole cover and cover the gap in the pipe, this will redirect the wind to the key. Take the key and insert it in the keyhole. There's an hidden button in the bottom-left corner, use it to activate the buttons. Now you have to match each number/letter to it's opposite: 9 - 0 / A - Z / E - W / N - S. So one way to do it will be like: Left column: Z - E - N - 0, Right column: 9 - S - A - W.
The final clue is "< 09 >", where < is West and > is East, so tap this buttons to finish the level: W09E. Now you have to solve the arrows game, by filling all the squares on the board. 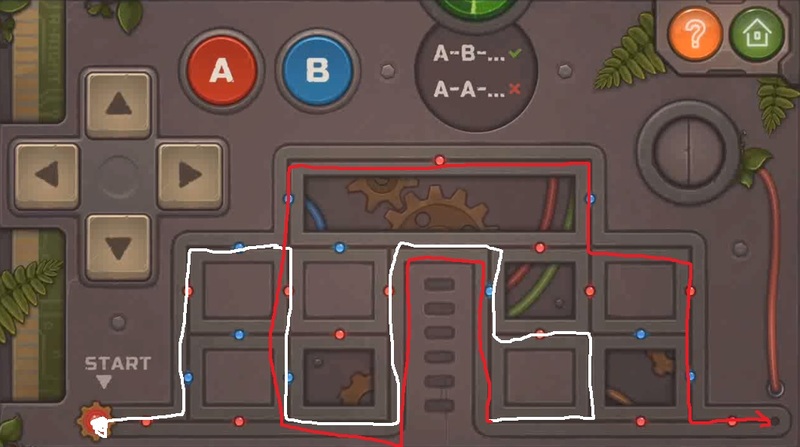 You have to start from middle-right arrow to complete it. Now you must press the 4 arrows that appeared on the top. You will find the first 3 arrows on the board. The last arrow is actually the "HOME" button in the top-right corner. Press it and you will see this pop-up: "Are you sure you want to unlock the next stage?". Tap "Yes" to complete the level. Keep the hourglass button pressed until the TV is turned on. Now switch the TV to the "CLOn" channel. They are not letters, actually they are patters that tells you which letters you need from the image in the first channel. The letters are: GOAL. Now write GOAL on the keypad by pressing this numbers: 46662555 then tap "#" key to confirm. You will notice a light will turn on, you need to solve 2 more tacks to complete the level. Now select the letters that the hint in the speaker panel tells you: ICED, and convert them to numbers on the keypad: 444222333 and #. First you need to spell "RADAR" with the available buttons. So press them in this order: (R)ight, (A), (D)own, (A), (R)ight. Now place the gear where it says "START". Now assign numbers, from 1 to 9, to each square, and enter the golden squares numbers on the keypad. The twisted arrow line, left of the keypad, tells you the order you need to press the numbers. So the second code is 1914. Unscrew the left panel to reveal a button with "0" key, and the next clue: LPM > 24. "L" is actually the hands of a clock that indicates 3:00 PM. Convert the time to army time to get the final code: 1500.